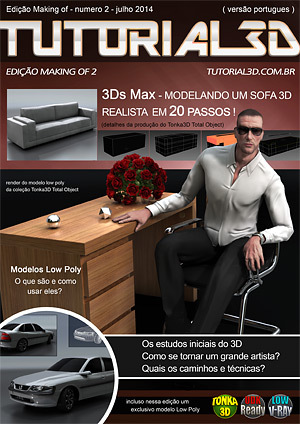 Click on the image below to open the second edition of the Tutorial 3D Online Magazine, where I posted a making of which details all the steps I took to create a 3D realistic sofa using the 3ds Max. It includes tips for 3D beginners and also a FREE low poly 3D model. Click on the image below to open this job I created for the Tutorial3D site blog, which details all the steps I took to come up with my God of Revenge character, since the concept up to the final production art. It is covered within 69 pages which is a very rich material for all Digital and 3D Artists. Unfortunately, the material presented on this digital magazine is all written in portuguese. Maybe, I will turn into english in the future depending on my availability. I created this image to showcase three old models that I made when I was working for Gameloft. I really don´t like the idea of having unfinished models on my hard disk. Cartoon models aren’t my favorite, but I actually really enjoyed creating this image. I used a lot of references, and one of my favorite places to search for inspiration and references is the 3DTotal Galleries. I used 3ds Max to create the models, as you can see, and I made all the parts separately so I could easily change the style of any of the accessories. Each modelled part was also given its own link or skin modifier. For the guys it was the same thing, but the clothing and bodies were the same mesh. I used mesh from the younger guy to create the larger man; soft selection from 3ds Max helped a lot with this. This next work was done for a still image, but if I had done an animation then I would probably have had to fix those areas shown in red in the wire frame. For example, the splines of the hair could have been converted to low poly models, and the same spline could have then been used as a bone for the hair. I used a FFD modifier in Max to correct some proportions of the shoes, so I collapsed and attached them to use the skin modifier. When I think in terms of animation, I create the things to be animated. It would of course be very interesting to animate this scene, but with this piece I was much more heavily focused on the modelling and texturing of the characters. Below you can see the major materials I used for the girl. It was also important to balance the materials with the scene lights. I always like to have at least four lights in a scene: one back light to produce the strong contour, helping the sub surface material to work, a left and a right light with different temperatures; and a main light to produce shadows and highlight areas. Another very important thing was to correct the lights with a grey material, applied to all scene objects. In this case, you can see that the light is good in both its intensity and colour. I always keep in mind that I must see where the lights come from and where are the main shadows are in order to maintain great volume in the scene. I used Mental Ray to render so that I could have the Global Illumination from a sky light, and so I could also have an occlusion pass for the post effects. In 3ds Max simply go into the material override, put a mental ray material with an occlusion in the surface, and you can have your occlusion image! Basically, I used Mental Ray so that I could have the Global Illumination from a sky light and have the occlusion image for the post effects. See in the figure how youcan achieve the occlusion image; firstly delete all lights from your scene and the follow the steps shown in the image. It is very easy to do and you will achieve great volume in your scene. Take a look now at how I adjusted this occlusion pass in Photoshop. The final image will have this as a Multiply layer on top. After compositing the layers, you can desaturate the whole image and increase the contrast in photoshop in order to see where the important areas are and how the contrast is balanced in the image. Take a look in the image below to see the balance between light and dark areas in this image. The floor and background are very important for characters, and I always try to put characters in a cool environment. In this example you can see that I used a lot of boxes with a mental (lume) in the diffuse colour slot. Some boxes are clearer than others in order to give more contrast and balance. I used a plane in the background with a texture to be reflected on the boxes; this texture is the same that I put in the final image. The choice colour I used in this work was primarily to enhance the look of the girl. As you can see, the two boys are looking at her, so is the center of the image – as is the red colour which is different to all the other colours used in this image. I desaturated the image a little in order to achieve a more realistic look, keeping the colours of the scene: green and red. And finally, here you can see the difference between the original and render and final image with a background. It’s cool to see what we can do with some of our old 3D models. Don’t let them die on your hard disk – get them out and reinvent them!